means 3,000 opportunities for our message to be lost. Social is how customers hear about you, search is how they find you and content is how they qualify you. None of them alone are strong enough to succeed, but together retailers can use these tools to deploy an awesome online marketing strategy. As of 2010, online advertising only accounts for 14 percent of advertising spending nationwide while traditional medias accounted for the other 86 percent. With that spend means there are eyeballs still absorbing traditional media and that is the greatest driver towards online activity. A mention that you’re online in a news broadcast or newspaper ad can help drive activity to your online storefront. Storefront=Online Storefront: Ensure that your online properties are the best that your budget can buy. Just like equipping your store with the best that you can buy your online properties need to reflect that as well. The consumer cannot see your storefront if your online presence does not reflect that storefront. Online=Offline: Synergy between online appearance and offline messaging is more important than ever. Making sure your messages speak clearly and loudly on your online properties is just as important as selecting the right traditional medias to spread your message. Any blip in this synergy in one way or the other can lead to a lost sale. Shareable: Does your message offline have the ability to be shared? The consumer controls the message the moment we promote it. With that knowledge, ensure that she has the ability to share it with her social community and what she is sharing makes sense. You can’t build a house by starting with the roof, and you can’t start converting online customers to your customers without setting the foundation for success. This blog is written by R&A Marketing and originally appears on www.ramarketing.com. 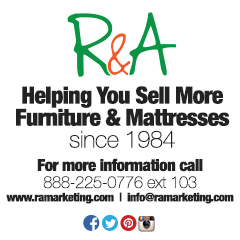 Armed with more than 25 years of furniture retail marketing experience as a full-service traditional and digital marketing company, R&A is the industry’s premier agency for retailers in the home furnishings and appliances/electronics industries. Visit us on the web www.ramarketing.com or email us at info@ramarketing.com.